Being the tinkerers that we are at Greyscale Racing, the success of the MRCG wasn't quite enough... and thus we now present, to MZR members exclusively, a first look at the upcoming MRCG1.1. The MRCG1.1 is an evolution of the original MRCG and shares all its CNC alloy parts with its older brother; however, the rest of the chassis has been completely updated for better geometry, durability, and user-friendliness. 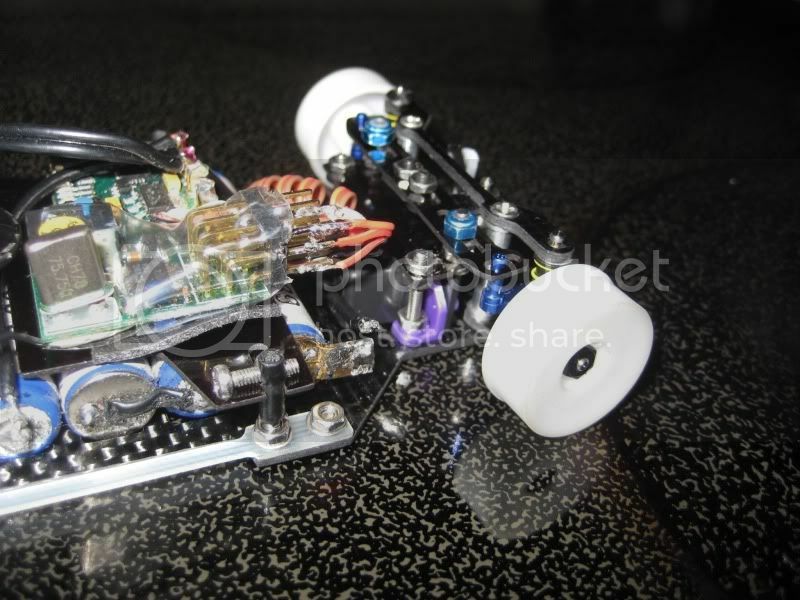 As you can see, the car's CG remains the lowest of all 1/28 micro RC cars. 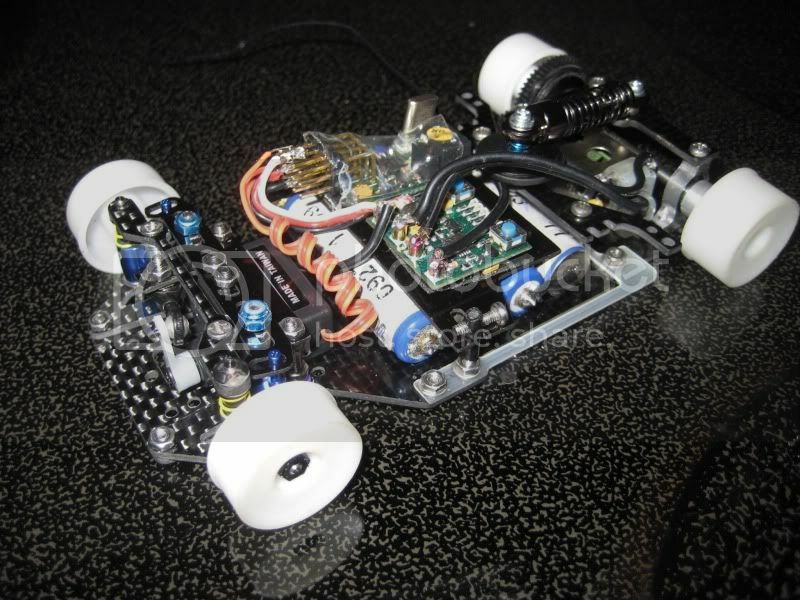 Even in its shortest wheelbase settings (94 and 96mm), the motor remains mounted flush with the bottom of the chassis, ensuring high corner speeds and quick transitions that the MRCG is now famous for. One of the most significant additions to the MRCG1.1 is support for 96mm and 100mm wheelbases! 96mm has recently been a super fast configuration to run with certain bodies (350Z, NSX come to mind), so the MRCG1.1 now takes that advantage back by allowing a 96mm configuration. 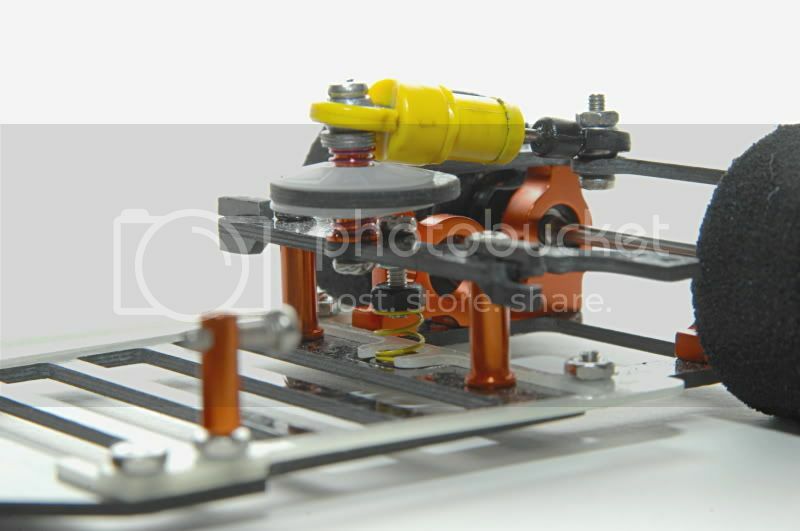 Along with it comes a 100mm wheelbase option for using LM, Pan-type or Lexan bodies on the MRCG on extremely large, flowing tracks. 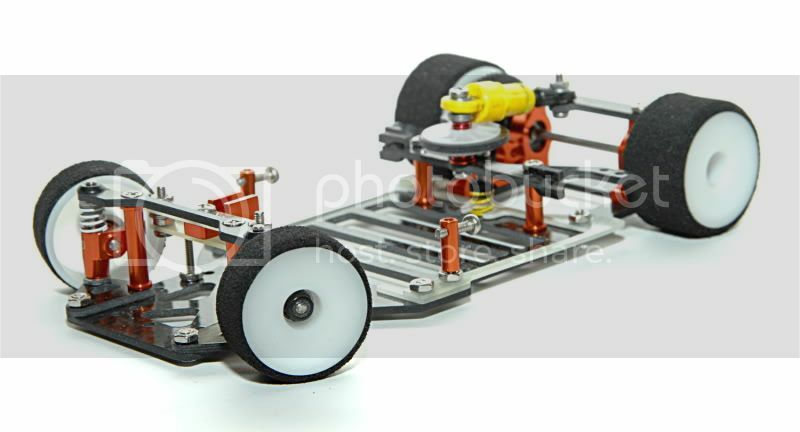 The original wheelbase configurations, 94mm and 98mm, still remain, giving the MRCG1.1 a total of four wheelbase options -- the most versatile 1/28 competition pan chassis ever. The MRCG's Virtual Center Pivot suspension is back, and with better geometry it's faster than ever. First to note is the new wraparound flex plate design: this configuration reduces pod deflection to give the car even more precise, consistent handling, while it allows for the addition of "ears" to hold the center spring in place -- again increasing precision. The MRCG1.1 also introduces new rear steer spacers that allow the rear pod to dynamically assist in cornering. By purposely inducing a fraction of a degree of rear steer, entry steering becomes more aggressive and fluid, and corner speeds increase dramatically -- even more so than the original MRCG. Why are there two sets of body post mounting holes? In fact, the smaller one is for the MRCG1.1's new side spring implementation. Instead of mounting the springs to the rear pod, they can now be mounted on the chassis brace, and the smaller size allows the mounting screw to be threaded into the carbon, allowing screw-turn spring preload adjustment. The MRCG1.1's new front end represents a logical evolution from the original car's. The lower L-arms have been replaced with stiffer, triangulated items to increase steering response and crispness; meanwhile, 2 degrees of caster have been incorporated into the upper bar to improve high-speed handling. Mounting anti-roll bars is a simple procedure: just replace the 5mm long screws in the front with 16mm screws, and you have the correct locations to install the anti-roll bar mounts. The new tierod is slightly stiffer and stronger, featuring crossmembers to eliminate deflection. The tierod mount has also been updated to use three overlapping mounting holes instead of a slot; this prevents the assembly from shifting around if you ever happen to get hit hard enough. Also notice, by the way, that the new rear steer spacers double as battery braces, preventing the batteries from getting knocked out in a collision. 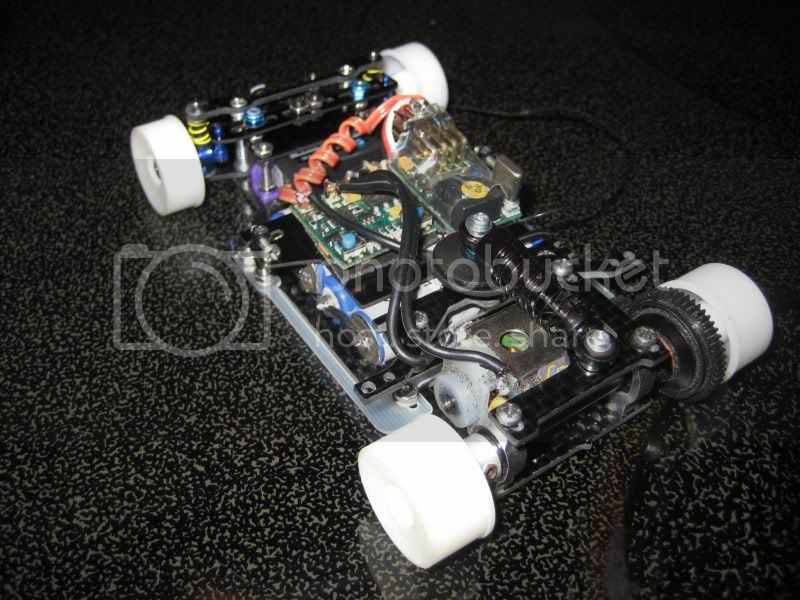 Like the original MRCG, all Pan-type and Lexan bodies are a direct fit on the MRCG1.1, and you can use either standard Mini-Z body clips or body posts (not supplied) to mount them. 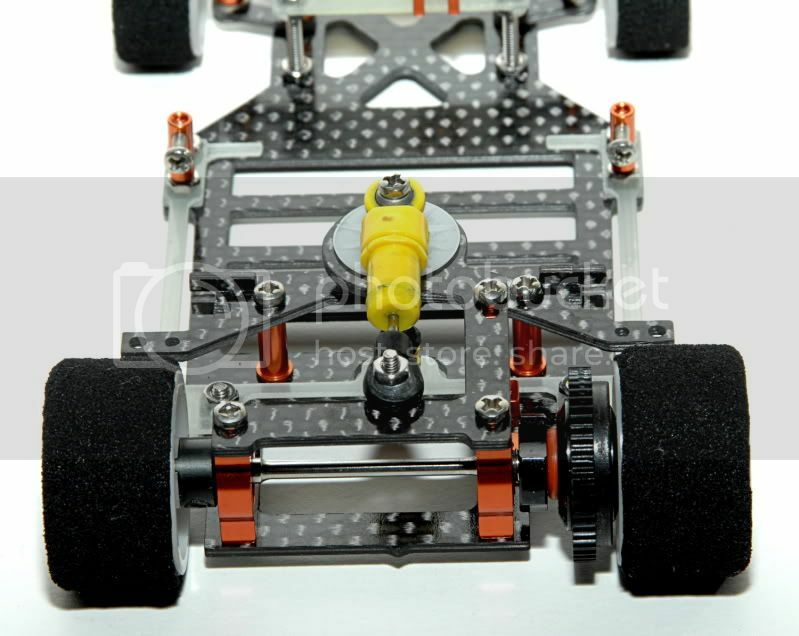 As you can see, standard body mounting height on the MRCG1.1 is a tad lower than your average Mini-Z -- perfect for RCP, Regupol, or carpet tracks around the world. And of course, the MRCG1.1 would not be as unique as it is, if it were not able to mount all MR02-compatible Autoscales and white bodies. No visible modification is required at all, only shaving the sides of the body clips. Hope you guys are ready for it. Last edited by color01; 2009.05.09 at 01:12 PM. I've been ready. This car looks even better then your last version. Cant wait to wheel this latest version. Congrats on the release!! Hi Brian, Looks great! 2 questions: When & how much? Thanks. Between speaking with David (TinyRC) and Philip (PN), I think we'll have a preorder up in June, and the kits will arrive by July. Hopefully, just in time for all the summer PN Regionals. As for pricing, it should be cheaper than the last PN-version MRCG, but no disk damper assembly included. We found that many customers actually didn't need the disk damper parts, so to cut down the retail price of the kit during these economic times, we'll let customers choose their own. Can you post a side by side of the old vs new? Erm... I... parted it out already, lol... I do have my CAD models though so if there are any details you'd like to know about, just ask. The 1.1 is the foreground car, with the original MRCG in the back. Care to play "spot the difference?" Mike / Get out and race! Shop local! Am I allowed to say that I got my car yet?? Ooops!!!! The original kit was killer, this one is more refined and just AMAZING, just the little things that were thought of are really trick. I will post pics of the roller 2morrow. Cant wait to try it!!! EMU, go check out the GSR forums ASAP, I have a little something for you. First official pictures of the car are trickling in; thanks go to Donziikid Photography for the excellent quality! Brian, it looks very cool. And, ummm... I want to subscribe. Here is my blacked out MRCG 1.1. Looks great Dave! I'll be waiting for you to break the NYRC lap record again. Looks good, what did you use to color the G10 parts?